Breed Group: Toy Weight: 6-8kgs Height: 30-32 cms Color(s): black, white, brown, gray, cream or particolor Coat: The Lhasa Apso has a heavy double-coat that is draped over the entire body Distinct feature: they have long and silky fur with miniature size. Eyes and nose are distinctively black. They have punch face. 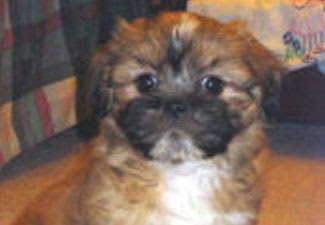 Temperament: The Lhasa Apso is a hardy and vigorous breed. They are wary and suspicious of strangers. They are considered to be one of the most affectionate breeds with their main function as that of a companion. They are highly expressive of their love and devotion, but have a mind of their own and want everything their way. They are lively and spirited Activity: The Lhasa Apso loves to play indoor games. The Lhasa is an excellent apartment and condominium dweller.